William O'Connor | Applied Financial Planning, Inc.
Bill entered the financial planning field in 1967 with a major insurance company. 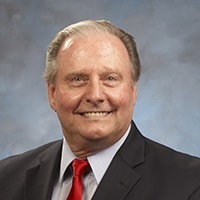 After a commitment to the United States Navy (an Honorable Discharge) and time out for schooling, Bill resumed his career in 1973 with a leading California financial institution. In 1979, he was instrumental in assisting a major bank establish personal financial planning centers throughout California. His duties included, but were not limited to, hiring and training bank officers to interact with the bank’s Trust, Commercial Lending, Retail banking, and the Bond and Money Market Divisions. Bill was one of the major contributors in helping the bank develop various internal staff educational programs, as well as numerous client services programs and related marketing materials. Bill founded Applied Financial Planning, Inc. in 1986, and is President of the corporation. Bill is a past member of the adjunct faculty of California Lutheran University and The University of California at Irvine. He has also taught investment planning and tax management as an adjunct faculty member for the National Endowment for Financial Education’s College for Financial Planning in Denver, Colorado and the University of Phoenix in Orange County. He has extensive experience lecturing on investment selection and management, personal and business taxation and other financial planning topics. Bill has written several workbooks, which have been used, on a national basis, as training materials for the Certified Financial Planner program. His workbooks, CFP®-Investment and CFP®-Taxation have been used on a national basis. He has been a contributing author to the business magazine, Main Street. Bill has been a member of the Orange County chapter of the Financial Planning Association having served on the association’s educational committee, responsible for providing continuing education for financial planners. He is licensed through the Certified Financial Planner Board of Standards and Practices and is listed as a registered practitioner with the Institute of Certified Financial Planners. Bill is also a member of the National and California Association for Enrolled Agents. As a CERTIFIED FINANCIAL PLANNER™ who is also licensed by the US Treasury to represent clients before the Internal Revenue Service; William specializes in Comprehensive Wealth Management developing individual strategies for his clients in four primary areas: (1) Creation & Growth of Wealth (2) Protection & Preservation of Wealth (3) Planning the distribution of wealth during life in the most tax efficient manner and (4) Planning the distribution of wealth at death to maximize the transfer of Wealth to the next generation.